Katherine Karrol has read 7 of 12 books. Katherine Karrol is both a fan and an author of lighthearted, sweet, clean Christian romance stories. Because she does not possess the ability or desire to put a good book down and generally reads them in one sitting, she writes books that can be read in the same way. Her books are meant to entertain and even possibly inspire the reader to take chances, trust God, and laugh at life as much as possible. The people she interacts with in her professional life have absolutely no idea that she writes these books, so by reading this, you agree to keep her secret. If you would like to contact her to share your favorite character or share who you were picturing as you were reading, you can email her at KatherineKarrol@gmail.com or get social with her Katherine Karrol is both a fan and an author of lighthearted, sweet, clean Christian romance stories. Because she does not possess the ability or desire to put a good book down and generally reads them in one sitting, she writes books that can be read in the same way. To ask Katherine Karrol questions, please sign up. We’d love your help. Let us know what’s wrong with this preview of Spearhead by Adam Makos. We’d love your help. 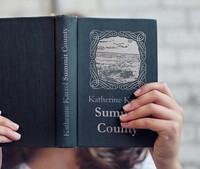 Let us know what’s wrong with this preview of Second Chance in Summit County by Katherine Karrol.
" FREEBIE ALERT! “Second Chance in Summit County” is available for free on Kindle until tomorrow, March 5. If you haven’t had a chance to read it, or if FREEBIE ALERT! “Second Chance in Summit County” is available for free on Kindle until tomorrow, March 5. If you haven’t had a chance to read it, or if you have the paperback but wish you could take it everywhere you go (am I the only one who likes my phone loaded with emergency books at all times? ), all you have to do is click this link between now and Tuesday night, and it’s yours for free! The Summit County Series is a series of short, light standalone Christian romances set in a small town in Northern Michigan (it’s not necessary to read them in order, but there are bonuses for those who do). This is the first book in the series, and all of the books are available on Amazon in both Kindle and paperback formats, as well as on Kindle Unlimited. I hope you enjoy reading it as much as I enjoyed writing it! Free Kindle eBooks, new releases, deals, and more! A place to share and discover Christian book giveaways.